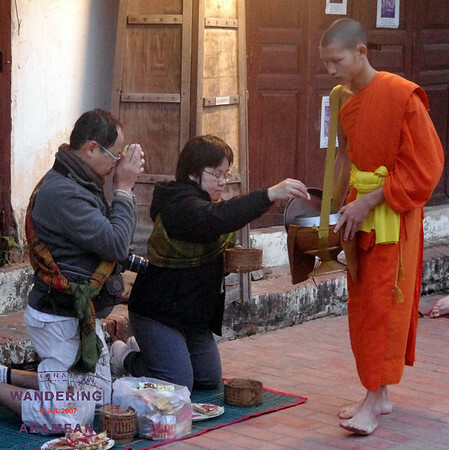 Read any guide book, trip report or other account of a visit to Luang Prabang, Laos and there is a very, very high chance you’ll read about the daily sun rise ritual of the local monks walking through the streets, collecting offerings of food for their daily meal. And, just to be clear, this is yet another such story. But I think my take on the scene is a bit different; certainly what I saw was very different from what I expected. Or at least it was very different than what I had hoped to see. 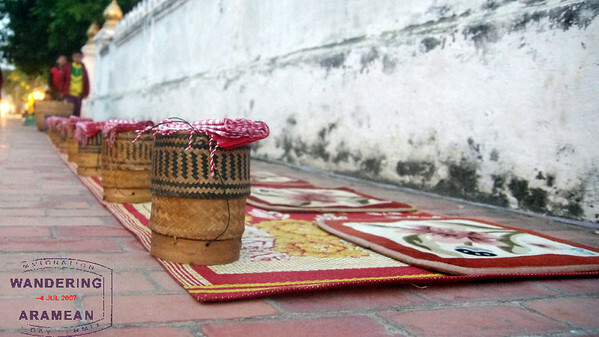 Shortly before sunrise mats begin to be set up on the sidewalks near the main pagodas of Luang Prabang. Most are set by hotels so their guests can participate in this ritual. And most have food provided by the hotels rather than the street merchants. That’s actually what the monks want; apparently the street vendors have a habit of providing food which makes the monks sick which isn’t so useful when this is their daily nourishment. And, for the most part, the people I saw setting up on the mats to offer food looked like they were taking it reasonably seriously. 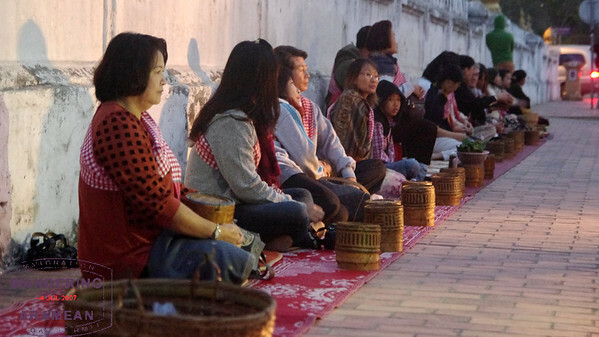 It is a spiritual offering, bonding with the monks, not a tourist excursion. Indeed, on the list of requests from the monks which I saw on a wall outside one of the pagodas they actually ask that people not give food if they aren’t going to take it seriously. 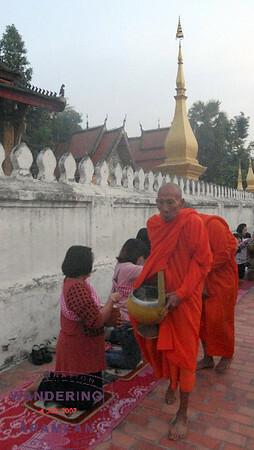 And then the monks began their shuffle down the sidewalks, collecting small offerings along the way. One of the more surprising things to me was seeing the people – mostly kids, but a few adults, too – along the route begging of the monks for food. And, every now and then, they would be successful in getting some rice or other food. That was pretty nifty to see happen. Overall I found the experience to be mostly a good one. The people who are taking it seriously make it rather moving. At the same time, however, I was quite disappointed in some of the behavior I witnessed from other spectators. It would probably do the monks some good to better publicize the "rules" of the event, things like avoiding flash photography and staying out of the way as the monks are walking along. Then again, I’d like to think that sort of respect comes naturally to most. Alas, it does not. Most of the people I saw respected the rules, the monks and the sanctity of the event. But there were enough who did not that it made me feel guilty about being there, watching it happen. Maybe it is just because we were there at a peak time so the crowds were more unruly than normal (a friend later related that the day she was there during the wet season she was the only one offering food). Or maybe things have changed enough with the tourists in Luang Prabang that it is no longer a ritual and more of a spectacle. Looking at the faces of the monks many seemed bored or bothered by the event. I know that I’d be rather annoyed if my daily breakfast routine involved hundreds of random strangers getting up in my face and taking flash photos. I cannot say that I blame the monks at all in that regard. We saw similar scenes in Yangon and Bagan, Burma and the spectacle part of it wasn’t there. Not quite as photogenic, certainly, but also not nearly the same level of "show" involved. Maybe I’m just bitter and disillusioned. And maybe I’m part of the problem. After all, I was there, shooting photos and video (though no flash!) and watching the parade as it happened. I just don’t know. When I got back to the room that morning to have breakfast it just didn’t feel right. Talking it over with @Veritrope the following evening over drinks it was still irking me. And now, three weeks later, I’m still a bit frustrated. Such is life, I suppose. More photos in the gallery here or on Facebook here. Great post.. I am actually traveling there in three weeks (part of a six weeks vacation in SE Asia). Defiantly planning to watch this.. Thanks. I spent 2 weeks in Luang Prabang and it was here that my whole attitude toward the monks and a lot of Southeast Asian Buddhism in general changed. This is where I saw the monks be greedy, materialistic, and entitled. I got to know some of the townspeople, some little old ladies who had very little money. Every morning these ladies would line up to give to the monks. Later in the day I would see the same monks smoking cigarettes, chatting on iPhones, listening to iPods, riding in cabs, etc. they live in huge golden monasteries while many other townspeople live in squalor. The monks don’t provide any social service. They don’t help the poor or the sick (as in Buddhism, that is your lot to suffer). These monks all enjoy this blush life. It is something woman are not allowed to partake in. Woman are not allowed education past I think it was 7th grade. Although it seems beautiful and serene and devout, these thoughts really troubled me over the next month as I traveled Laos and the north of Thailand. Don’t get me wrong, Luang Prabang is still one of my top favorite destinations in the world. It is just a thought I had and wanted to share. Flash or no flash, it’s inappropriate to photograph the monks at close range. If you want to photograph them, do it from the opposite side of the street. Monks are just as greedy as everyone else. I learnt this from reading on Dalai Lama and why he was close to communists first and later fled. I appreciate the honesty of your writeup. I’ve often felt this way when traveling. Hey, you’re in the Amazon, don’t you want to pet/feed/photograph the tourist-trained monkeys/huge captive fish, etc. Finding “honest” tourist experiences is very difficult and something I rarely am able to accomplish. I think it takes a lot of bravery and willingness to veer off the beaten path. This was not meant as criticism. I felt exactly the same way when I was in Luang Prabang. A part of me felt bad for the monks because the whole thing felt like a spectacle set up for the tourists. And yet, there I was, a willing participant in the charade. I also felt extremely frustrated with those tourists who would stick their camera in the monks’ faces and use flash and even chase them down the street like the paparazzi. It was bordering on being vulgar. If people were just a little more respectful and less intrusive, the whole thing would be a lot more beautiful. 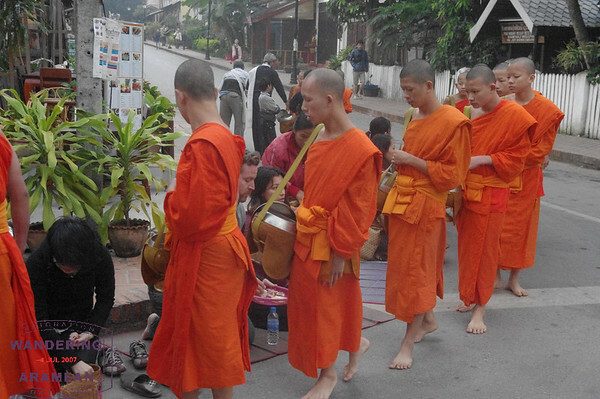 @Brandon, I actually didn’t notice any bad monks in Luang Prabang. Walking around town, I saw many monks doing manual labor in their temples, conducting their daily chants, and even learning English from Western volunteers. The worst was in Bangkok or Thailand in general, where monks were sporting iPads, smartphones, riding in Mercedes, etc. But I think that’s just a symptom of their locale and society. I saw the monks 5 years ago and there was nothing of what Brandon mentioned. Didn’t see it in Cambodia either. I did however see the same thing that Seth saw, folks running up to the monks and taking up close and flash photos. I disagree that “everyone” doesn’t know the “rules” about collecting alms. Let the monks alone. Take your pics from a distance. If you don’t have a zoom lens then too bad, you just don’t get the close up! Enjoy the beer lao and the sticky rice. I’m never sure what to do when I visit a cathedral, a church, or a temple. I wonder if it’s respectful for me to photograph people as they worship? It seems like it should be a private and solemn moment, and for me to photograph someone, especially without their permission, seems discourteous. As always, an interesting and thoughtful post Seth. Buddhism does not state that women can not be monks. Societal rules over the years corrupted the message. The Indian king Ashoka’s grandchildren became monks and went abroad. The offering of food is a societal bargain to maintain and transfer the knowledge and not worry about the daily grind of food. Materialism is bad in every religion. When we went to the Vatican, there were gaudy and ostentatious displays of gold and art from all over Europe gathered during long periods of famine and societal suffering. The rich displays contrasted with the suffering and sacrifices 2000 yrs ago, before the edifices. I guess the Romans took over the message somewhere in the 4th century and the Roman traditions now live on. I had similar misgivings when I was there and saw all of the tourists. Last year in Mandalay, Burma my guide took me to a big monastery complex. 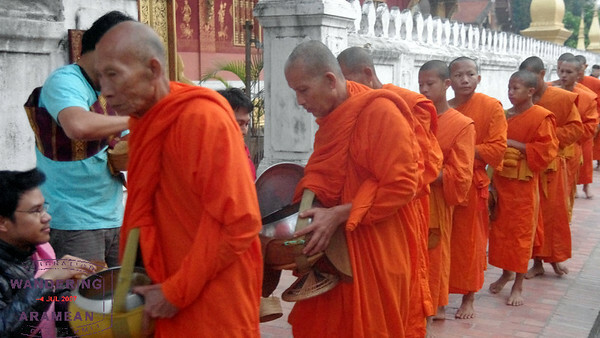 Every day at 11 AM the monks line up and parade to lunch. It is a big tourist thing. The rules are posted and were largely ignored by the tourists, especially Russians. I put my camera away when the whole thing started. I don’t like the idea of turning people into tourist attractions like they are zoo animals. So I was determined not to participate. I watched quietly though so maybe that’s not much better than snapping away with my camera.